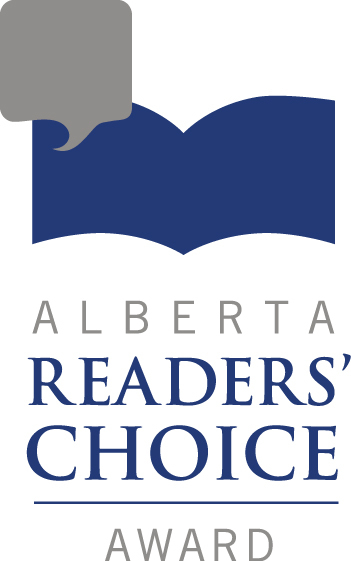 Sponsored by the Edmonton Public Library, the Edmonton Public Library Alberta Readers’ Choice Award is awarded annually for the best fiction or narrative non-fiction written by an Alberta author. The $10,000 award – presented annually by the Edmonton Public Library and one of Alberta’s richest literary prizes – recognized the exceptional writing talent in Alberta and encourages readers to support Alberta authors. I considered applying to sit on the jury for the Alberta Readers’ Choice Award this year, but was intimidated by the amount of reading I’d have to do. I shouldn’t have been; I’d already read five of the longlisted ten (chosen by library staff across Alberta) and of the shortlist (decided by the jury,) I’ve read three of five, and own another. Ah well. I’ll have to be satisfied with the power of my vote. Regular joes like us decide who wins, and the winner gets a novelty-sized cheque for $10,000. Vote here. Voting is open for the whole month of May. Only one vote for person, so no annoying “vote everyday!” social media blitzes. Today, I’m off to my local library branch, Jasper Place, to hear the four Edmonton-based authors read from their shortlisted books. We’ll also hear from readers, which is a cool twist! Check it out at 1:30 p.m. today, May 24th. Last year’s winner was Frank Kimmel, for The Shore Girl, which is still on my to-review list (it’s great.) Check out Another Book Blog’s review and interview. I met Fran at a reading last year, and someone asked her what she spent that novelty-sized cheque on, which was a little rude if you ask me! Fran said she would spend it on upgrading her technology. The $10,000 prize would certainly be enough to get some sweet gear. 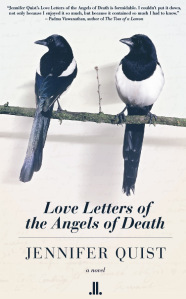 For me, the best Alberta book of 2013 wasn’t even on the longlist – Love Letters of the Angels of Death by Jennifer Quist. Roost by Ali Bryan was an oversight too. I don’t know if it’s proper etiquette to say who I voted for, but I’m nosy and I want to know who you are voting for, so here goes. I voted for the book that surprised me the most and brought me the most joy as a reader: The Dilettantes. Which book has your vote? A breathtaking literary debut, Love Letters of the Angels of Death begins as a young couple discover the remains of his mother in her mobile home. The rest of the family fall back, leaving them to reckon with the messy, unexpected death. By the time the burial is over, they understand this will always be their role: to liaise with death on behalf of people they love. They are living angels of death. All the major events in their lives – births, medical emergencies, a move to a northern boomtown, the theft of a veteran’s headstone – are viewed from this ambivalent angle. In this shadowy place, their lives unfold: fleeting moments, ordinary occasions, yet on the brink of otherworldliness. In spare, heart-stopping prose, the transient joys, fears, hopes and heartbreaks of love, marriage, and parenthood are revealed through the lens of the eternal, unfolding within the course of natural life. This is a novel for everyone who has ever been happily married — and for everyone who would like to be. The fact is, the opening scene is based on a real experience my husband and I shared when his father died unexpectedly and alone. During that disaster, I coped with my own shock and grief by making my husband’s feelings and perceptions the only things that mattered to me. It was a desperate strategy meant to get both of us through the experience as undamaged as possible. I went back into that hyper-empathetic frame of mind to write the first chapter of the novel. I’d been there before. The rest of the book – the fiction – evolved out of that truth. I figured it was the story of a happy marriage made even happier by a traumatic event. That’s… not how it works for me. My husband lost his father four years ago, just three weeks before the birth of our first child, which was traumatic and accompanied by postpartum depression. We turned inward rather than toward each other. Neither of us were good spouses during that time. So, I was prepared for a literary smack upside the head – why didn’t this make us stronger? Why couldn’t I put my needs aside when my husband was grieving? Why couldn’t he see that I was struggling too? I wrote about reading local last year, and why I think it’s important. I don’t know if there’s an exceptional crop of Edmonton books out this season, or if I’m just paying more attention, but I’ve got a short list that could rival any hoity-toity book award. 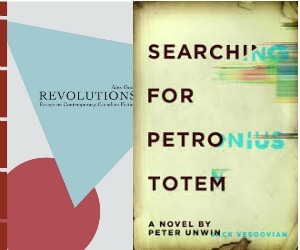 Here are my most anticipated #yegbooks for Fall 2013. Which ones are on your To Be Read list? I received a review copy from the publisher, Linda Leith, but assure you it was my most anticipated book before that happened. I love Jennifer’s blog. Every post has me nodding my head in agreement. She’s a beautiful writer. She got a great review in the Montreal Review of Books. The novel is about a happy marriage. I like to read about dysfunction so much that maybe I need to change things up.